The Idle Historian recently pointed me to a great BBC series on the lives of domestic servants in Britain in the 19th and 20th centuries. The three-part documentary is meant to “dispel the nostalgia and fantasies that we have around domestic service.” It is delivered with real passion by Essex University historian Pamela Cox, whose great-grandmothers were in service. With the popularity of shows like Downton Abbey and the new (and even more romanticized) Upstairs Downstairs, this is a good time to remember that life for domestic servants was extremely harsh and often cruel, with few rewards and none of the rights that other workers had (such as they were), not even the right to be addressed by their own name. It amounted to little less than slavery, with a touch of apartheid thrown in for good measure. Servants were generally considered to be sub-human and disposable, which conveniently justified their extremely low wages and poor living conditions. Servants who were too sick or old to work (or had gotten pregnant, by whatever means) were simply turned out into the street. As Britain industrialized and other forms of work became available, workers (especially men) left domestic service in droves, causing the remaining servants to be squeezed even harder to make up the deficit. Attempts were made to force women into domestic service by denying them unemployment insurance. Employers lamented the “work shy” “servant class,” as though they were put on Earth solely to serve and were being perverse in refusing to do so. As education and employment opportunities improved, workers voted with their feet and servants became a thing of the past for all but the very wealthy, and even they had to grudgingly capitulate to the demands of the increasingly scarce domestic labour supply. Lest we think this is all in the past and we know better now, the same thing is happening today. Employers in various industries complain that they cannot find willing workers and so they must import workers from abroad. The reality is that the jobs in question are too low-paid and unpleasant or dangerous to attract workers who have other options. However the experience in Britain shows that employers will never admit this. They will blame the “lazy” workers and do nothing to make the jobs more attractive and humane. Indeed the British did also import domestic servants, including Jews fleeing Naziism who were forced into service no matter what their profession had been previously. This continues today with nannies brought in from the Philippines and elsewhere, some of whom are highly educated, and some of whom encounter conditions as harsh and abusive as their Victorian predecessors. These jobs were and are so bad that only the desperate will take them. What does that say about our society? Are we really classless when we have one standard for “skilled” workers and another for domestic or agricultural workers, or more to the point, one standard for ourselves and another for foreigners? What does it mean when we take advantage of poverty to lower wages and increase hours, either at home or abroad? Do we really believe in the inherent worth and equality of all human beings or only when it doesn’t cost us anything? Documentaries like this are not just a fascinating glimpse of the past but a mirror for the present and we would do well to look. 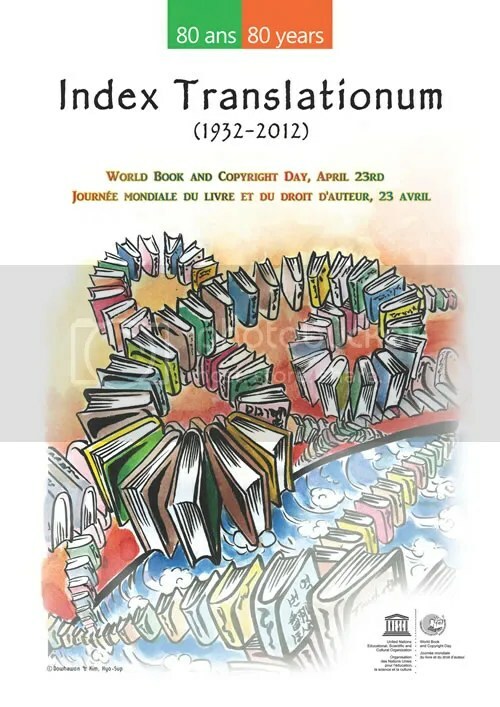 The theme of 2012’s World Book and Copyright Day is books in translation. This year is the 80th anniversary of the Index Translationem, a global database of books in translation maintained by UNESCO. You can look up some interesting statistics on the website, such as the 50 most-translated authors (Agatha Christie is #1! ), or the top 50 target languages (German, French and Spanish are the top 3). English is the most-translated original language, and Latin and Ancient Greek were 10th and 12th, respectively, ahead of languages like Chinese, Arabic, and Portuguese. 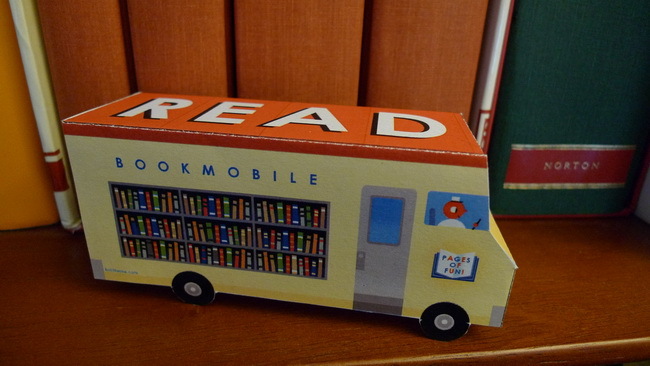 People still want to read the classics, it seems! The World Book Capital chosen by UNESCO this year is Yerevan, Armenia. It’s a good choice because writing and books, along with faith, have been a matter of survival for Armenians. Located on the crossroads of empires, Armenia has been subject to invasions and conquests for millennia. In the year 405, the Armenian monk Mesrop Mashtots saw that the only way to prevent his people from being assimilated, as so many others had been, was to preserve their language with its own alphabet. The Armenian alphabet he created is truly beautiful, and Mashtots is regarded as a saint by Armenians. As a result of all those conquests, the Armenian diaspora is large and everywhere they went they set up publishing houses, beginning in Venice exactly 500 years ago. That was also a time of invasion and Armenian publishers felt that printing books was the way to preserve their culture. Indeed from 1512 to 1918, Armenia as a country did not exist, and yet 20,000 books in Armenian were published. Five centuries of perseverance paid off in 1990 when Armenia declared independence from the USSR. One can only hope that Armenians will now have many years of peace in which to enjoy their books! Tenochtitlan dazzled its invaders—it was bigger than Paris, Europe’s greatest metropolis. The Spaniards gawped like yokels at the wide streets, ornately carved buildings, and markets bright with goods from hundreds of miles away. Boats flitted like butterflies around the three grand causeways that linked Tenochtitlan to the mainland. Long aqueducts conveyed water from the distant mountains across the lake and into the city. Even more astounding than the great temples and immense banners and colorful promenades were the botanical gardens—none existed in Europe. The same novelty attended the force of a thousand men that kept the crowded streets immaculate. (Streets that weren’t ankle-deep in sewage! The conquistadors had never conceived of such a thing.) And the whole of this wealth and power, Cortés subsequently explained to the Spanish king, flowed into the hands of Motecuhzoma. Can there be anything more magnificent than that this barbarian lord should have all the things to be found under the heavens in his domain, fashioned in gold and silver and jewel and feathers? And so realistic in gold and silver that no smith in the world could have done better? And in jewels so fine that it is impossible to imagine with what instruments they were cut so perfectly?…In Spain there is nothing to compare with it. In Nahuatl rhetoric, things were frequently represented by the unusual device of naming two of their elements—a kind of doubled Homeric epithet. Instead of directly mentioning his body, a poet might refer to “my hand, my foot” (noma nocxi), which the savvy listener would know was a synecdoche, in the same way that readers of English know that writers who mention “the crown” are actually talking about the entire monarch, and not just the headgear. Similarly, the poet’s speech would be “his word, his breath” (itlatol ihiyo). A double-barreled term for “truth” is neltilitztli tzintliztli, which means something like “fundamental truth, true basic principle.” In Nahuatl, the words almost shimmer with connotation: what was true was well grounded, stable and immutable, enduring above all. Because we human beings are transitory, our lives as ephemeral as dreams, the tlamatinime [philosophers] suggested that immutable truth is by its nature beyond human experience. On the ever-changing earth, wrote León-Portilla, the Mexican historian, “nothing is ‘true’ in the Nahuatl sense of the word.” Time and again, the tlamatinime wrestled with this dilemma. How can beings of the moment grasp the perduring? It would be like asking a stone to understand mortality. Ayocuan’s remarks cannot be fully understood out of the Nahuatl context, León-Portilla argued. “Flowers and song” was a standard double epithet for poetry, the highest art; “jade and quetzal feathers” was a synecdoche for great value, in the way that Europeans might refer to “gold and silver.” The song of the bird, spontaneously produced, stands for aesthetic inspiration. Ayocuan was suggesting, León-Portilla said, that there is a time when humankind can touch the enduring truths that underlie our fleeting lives. That time is at the moment of artistic creation. “From whence come the flowers [the artistic creations] that enrapture man?” asks the poet. “The songs that intoxicate, the lovely songs?” And he answers: “Only from His [that is, Ometeotl’s] home do they come, from the innermost part of heaven.” Through art alone, the Mexica said, can human beings approach the real. Cut short by Cortés, Mexica philosophy did not have the chance to reach as far as Greek or Chinese philosophy. But surviving testimony intimates that it was well on its way. The stacks of Nahuatl manuscripts in Mexican archives depict the tlamatinime meeting to exchange ideas and gossip, as did the Vienna Circle and the French philosophes and the Taisho-period Kyoto school. The musings of the tlamatinime occurred in intellectual neighborhoods frequented by philosophers from Brussels to Beijing, but the mix was entirely the Mexica’s own. Voltaire, Locke, Rousseau, and Hobbes never had a chance to speak with these men or even know of their existence—and here, at last, we begin to appreciate the enormity of the calamity, for the distintegration of native America was a loss not just to those societies but to the human enterprise as a whole. The note for “garlands” reads: “Wreaths; also, since garlands were a symbol of poetic achievement, poems of praise.” So here we have to completely isolated cultures using flowers to represent poetry! I wonder if there are others? So the nineteenth century gave us global time, deep time, and a new sort of everyday uniform time, and there’s one time that the whole of Britain has always been glad to move on to – tea time. 😀 Naturally the next object in the series is an early Victorian tea set! I sometimes listen to the A History of the World in 100 Objects podcast from the British Museum (via the BBC, highly recommended) while cooking. In yet another incidence of reading/learning synchronicity, the episode I listened to today dealt with Captain Cook’s arrival in what we call Botany Bay, Australia. The object in question was a wooden shield dropped by an aboriginal fighter after he realized that mangrove bark was no match for musket shot. The fact that the aboriginals tried to stop the Europeans from landing shows that there was no misunderstanding on their part—they knew perfectly well that those people were bad news! Alas, they did not have the technology to fight them off, and the rest is not just history but also present and future. It remains to be seen how it will all turn out. 250 years out of 60,000 may turn out to be just a blip. Is there such a thing as book synchronicity? Because I have been experiencing something like that lately. It started with Robinson Crusoe. I read Moll Flanders last year and thought it was high time to read Defoe’s most famous work, Robinson Crusoe. That was really my first direct exposure to the Age of Exploration and the thrills of shipwrecks, pirates, booty, and desert isles, and the not-so-thrilling realities of slavery, plunder, dispossession, and imperialism. Of course I had heard about all these things before but never really knew much about them. It’s hard to imagine that there really were people like Alexander Selkirk, the inspiration for Robinson Crusoe, who were having such a rotten time aboard ship that they just said, “Why don’t you just leave me on that deserted island over there and I’ll wait for the next ship.” I suppose if you’re intrepid enough to take to the seas in a leaky ship you are intrepid enough to camp out on a tropical island for a few years. I won’t go into Robinson Crusoe. It is enjoyable as a survival story but at bottom it’s about a man who makes a fortune off of other people’s misfortune and calls it divine providence. He is really not that different from Moll Flanders, the thief and con artist who buys her way out of the noose and also ends up as a wealthy plantation (i.e. slave) owner. Perhaps they are representative of the kind of people who had what it took to liquidate the New World. After that I read about Amerigo Vespucci, the Florentine trader and explorer for whom the Americas were mistakenly named. That really got me interested in knowing more about this history, a history that is literally in my mestizo (Spanish-Indian) blood. Since I also like to keep some fiction going, I started Romola by George Eliot. Wouldn’t you know it, it begins in 15th century Florence, exactly the environment that spawned Vespucci. In fact it begins precisely in 1492, just a few months before Christopher Columbus set sail for China (or so he thought). By this time I realized resistance was futile so the next nonfiction book I chose was 1493: Uncovering the New World Columbus Created. That was going nicely until I discovered that is the book is actually a sequel to 1491: New Revelations of the Americas Before Columbus. So, do I abandon 1493 and read 1491 first? Or just read 1491 later? I have 1493 in audio format but 1491 is not available to me as an audiobook. So I had the crazy idea of reading both at the same time, one in text and the other on audio, alternating chapters. Would it be completely confusing? Or would it meld the whole story of contact into a seamless whole? I guess I will find out. If I survive that I can follow it up with The Faber Book of Exploration, a large tome which I recently picked up at the thrift store in (*cough*) unexplored condition. It is an anthology of writings by and about over a hundred ancient and modern explorers. 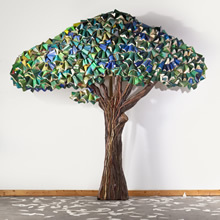 Interestingly the book is organized by biome (sea, forest, desert) rather than chronologically. The editor is mainly interested in what makes explorers tick and how they react to the unknown, rather than just who discovered what and when. That sounds like a good way to make history seem human and immediate. Let the voyage continue! I recently read Amerigo: The Man Who Gave His Name to America, a rather dry, scholarly debunking of the myth of Amerigo Vespucci, for whom an entire hemisphere’s worth of land was named. The author goes to great lengths to show that Vespucci likely didn’t make all the discoveries he was credited with, and what he did do (celestial navigation) he did badly. Columbus certainly beat him to the Caribbean, and may have beaten him to South America as well. Unlike Columbus’ voyages, Vespucci’s two (or three? or four?) trans-Atlantic trips are poorly documented, and most of the evidence for his South American discoveries comes from letters that are throught to be partial or total fabrications. Historians today don’t blame Vespucci for stealing Columbus’ thunder. It seems those letters claiming he found the continent of South America first, and knew it was a new continent and not part of Asia, were written by someone else. Who that was is lost to history, but it doesn’t matter any more. When published the letters naturally caused a sensation, and the German cartographer Martin Waldseemüller graciously named the new continent after its purported discoverer. 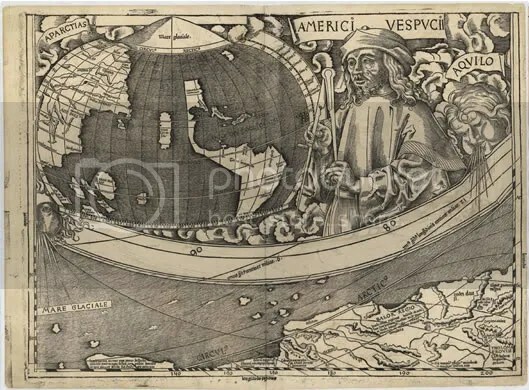 His world map of 1507 (below) goes so far as to feature Vespucci and his compass opposite Ptolemy and his sextant, as the two greatest mappers of the world. The mistake was soon discovered and Waldseemüller retracted his naming of America, but the cat was out of the bag. When Gerardus Mercator’s 1538 world map called the new continents Americae (Americas), there was no going back. As far as we know, Vespucci, who died in 1512, never saw Waldseemüller’s map and never knew that the continents had been named for him. Imagine! I feel sorry for Columbus. Although he did get a country, a magnificent province (ahem), a national capital, and many other places named after him, I really should be living on North Columbia not North America. However, as few people have heard of Vespucci, and every child knows who sailed the ocean blue in 1492, I think Columbus’ fame is secure no matter what the maps say.